Stepping outside our comfort zone is something that most people will avoid doing unless absolutely necessary. There are those lucky few who seem to thrive by living life on the edge, but for most of us, there’s something truly unnerving about moving into unexplored territory. I guess I’d place myself somewhere in between. I like to push my limits because I feel it improves me as a person and allows me to grow and learn from the experience. But I’m also cautious when I take these steps and prefer to feel my way around before jumping in head first. This is true for many aspects of my life and off-roading is no exception. 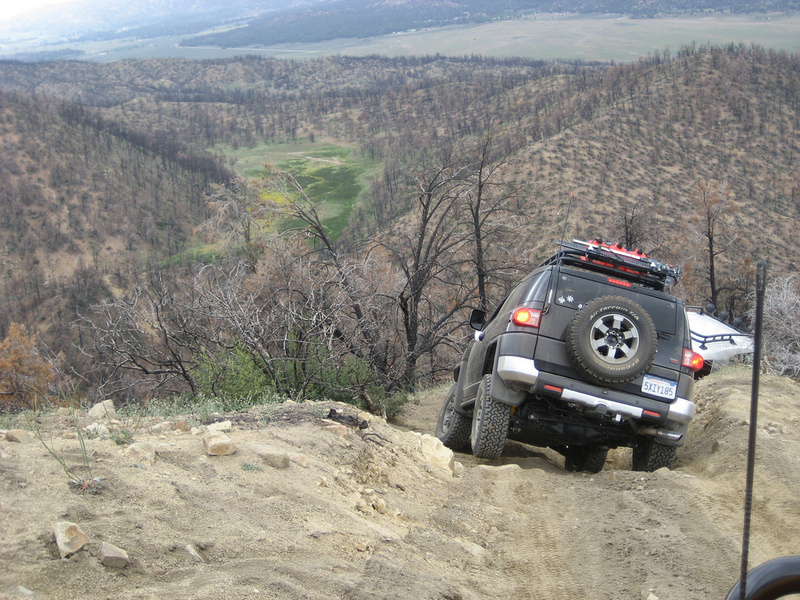 Every time I push my limits as a driver or the physical limitations of the FJ, I get nervous, but over the years I have discovered a few tips and tricks that help to reduce the stress. First and foremost, be patient with yourself and be aware of your limitations as a driver. If you are truly not comfortable traversing an obstacle then don’t let yourself be goaded or coerced into doing so. That’s usually a recipe for disaster. On the flip side, however, there will be times when someone with more off-roading experience can provide enough assistance to help you through an obstacle. In fact, a good trail guide can usually determine if your vehicle is capable of making it through an area and will normally have the necessary experience to spot you through successfully. At that point, the only real limitation is in your own confidence level as a driver. While there are some obstacles that require constant or excessive fuel flow, a good portion of obstacles can be overcome using the slow and steady approach. Finessing your way through an obstacle has several advantages to include keeping the vehicle under control and greatly reducing the chances of breaking something. Excessive wheel spin + sudden traction = potential breakage. Using a calculated approach will typically yield a lot better results, and as an added bonus, you’ll find that your skills behind the wheel will actually improve as well. As a driver you’ll be more conscious of your surroundings and picking a good line will slowly become second nature. If your vehicle is fully armored for World War III and your experience in the off-road arena falls into a similar category, then you’re probably okay to hit the more difficult trails. But if you’re running in a near stock configuration, or lack the necessary experience, I would heartily suggest sticking with the easier obstacles. Just like a driver, the more prepared your vehicle is, the better it will perform in the field. Familiarizing yourself with your vehicle can take some time but the more time you spend in the field testing it, the better off you’ll be. Start by getting to know how the vehicle performs in a stock configuration. Each time you add to or modify the vehicle, take it out and test it again. The more drastic the alteration, the more the driving characteristics will change. Adding those kick-out rock sliders might mean you can’t pass through the same obstacles you used to. Adding front and rear lockers makes you more capable but also requires a bit more caution with an independent front suspension. That new belly-pan skid plate you just added provides great protection but it also reduces your break-over clearance. In the long run, the more you know about how your vehicle performs in different circumstances, the more relaxed you’ll be on the trail. It’s more than just a motto for the Boy Scouts. Being well prepared for the most common scenarios will save you a lot of heartache in the long run. Being prepared when off-roading can cover a gamut of areas, but the most common practice is to ensure you have the right equipment. This covers everything from belly armor and rock rails, to on-board safety and recovery equipment. The out-board equipment you carry will help to boost your vehicle’s capabilities off the pavement, while the on-board equipment will ensure you make it home safely. Being prepared also means ensuring you are familiar with the equipment you carry. Tools like the hi-lift are a priceless commodity in the field but in the wrong hands a hi-lift can be quite dangerous. Carrying a first aid kit is always a good practice but like the hi-lift, if you don’t know what you’re doing, you can do more harm than good. Practice jacking your vehicle under controlled conditions at your own home to get familiar with how it works. Sign up for a local first aid class in your area to learn more about emergency response. Lastly, make sure you test and maintain your equipment on a regular basis. There’s nothing worse than discovering your equipment is broken when you need it most. Although it may seem like a hassle, those that practice good preparation techniques will ultimately have fewer worries on the trail. If there’s only thing I’ve learned over the years, it’s that you should never test fate. Smart rule of thumb – If it’s nearing the end of the day, avoid trying anything too crazy. Unexpected trail repairs when folks are ready to head home, can turn a day of fun into a long evening of frustration. Late-day repairs mean that light is usually fading and folks are normally tired and not thinking as clearly as they are during the morning hours. If in doubt, come back the next day when you and your fellow trail mates are feeling renewed from a good night’s rest. I normally apply this same line of thought to the last day of wheeling during an event too. As a rule, I will normally spend the first day or two wheeling hard and then back off and relax, hitting the easier trails during the last day. This one should be fairly common sense but I still hear about a lot of folks heading out to a trail by themselves. It’s just like swimming – always go with a buddy. Knowing that there’s someone else there to assist you can alleviate a lot of stress. From a safety standpoint, if someone gets hurt there’s another person around to treat them or go for help if required. From a getting stuck standpoint, it means a second pair of hands and a second trail-capable rig to retrieve you if you get mired down. A second driver can provide the primary rig with a trustworthy spotter through the more difficult obstacles and ultimately translates to twice the tools and supplies (assuming both vehicles are well stocked). There’s a good reason why most off-roading parks don’t allow single rigs to venture alone on their trails. It’s just asking for problems. Wheeling with two or more rigs means less stress and more fun. This last one is by far the most expensive cure for stress relief but it’s also one of the most effective. There’s no doubt about it, trailering your rig to an event can make the experience a whole lot less nerve-wracking. While it costs a bit more in fuel (not to mention the expense of the tow rig and trailer), it allows you to push your vehicle a bit harder than normal because it’s no longer needed as the primary mode of transport to and from your destination. In most cases, the main reason that most people don’t trailer their rigs is because many folks cannot justify owning a tow rig and a car hauler. But if you have access to these items or the means to purchase them, I highly recommend this method. These are just a few of the things that I’ve learned over the years. In my experience, less stress equals a better outcome and I’ve discovered that the more relaxed I am on the trail, the clearer my head for making informed decisions. I tend to be very methodical when approaching an obstacle and I really do prefer to finesse my way through things. But when things get a bit hairy and don’t go as planned, keeping your head is key. It has definitely taken some practice and a whole lot of extra patience, but in the end I’d like to think I’m improving as a driver. And ultimately, my trips off-road are now a lot less stressful than they used to be.